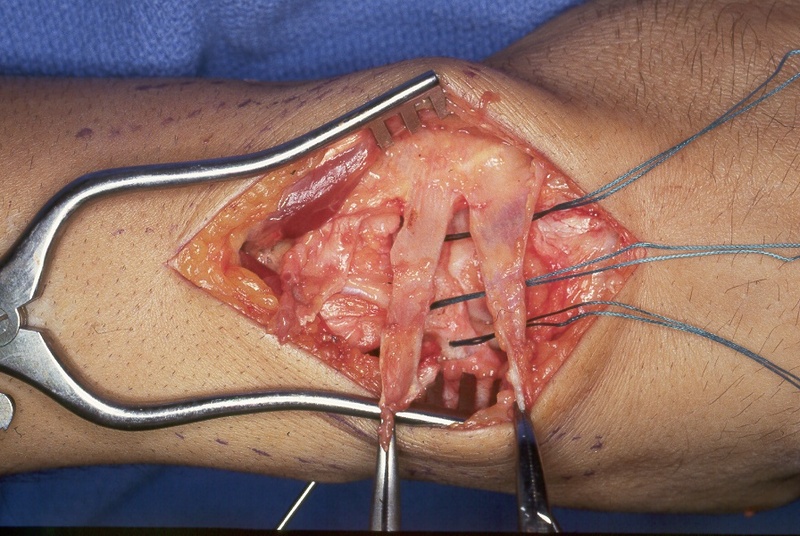 Chronic scapholunate ligament instability remains an unsolved problem. 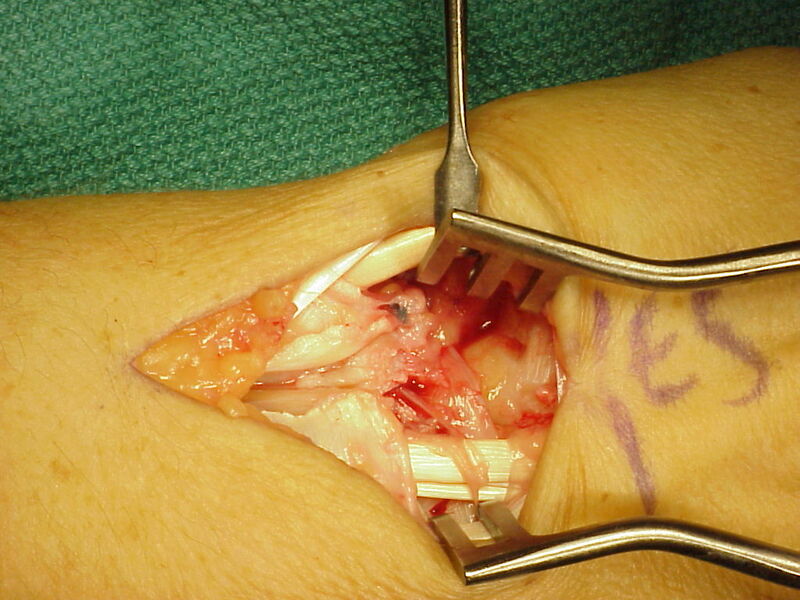 A variety of approaches have been described, including bone procedures, such as limited intercarpal fusions and proximal row carpectomy, as well as soft tissue procedures of ligament reconstruction such as direct repair, capsulodesis, tendon graft, and bone-ligament-bone graft. 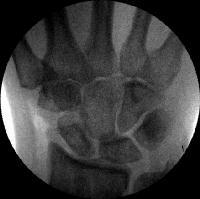 None are entirely satisfactory because of the common outcome of late failure. 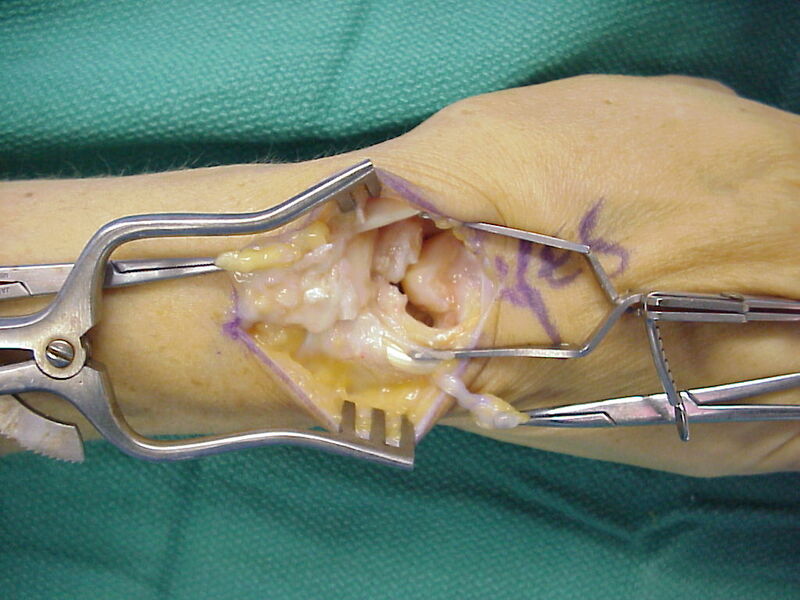 These cases demonstrate an unpublished soft tissue technique, employing a strip of extensor retinaculum attached to the dorsal triquetrum, inserted into the distal dorsal scaphoid to construct a dorsal intercarpal support along the path of the normal scaphotriquetral ligament. 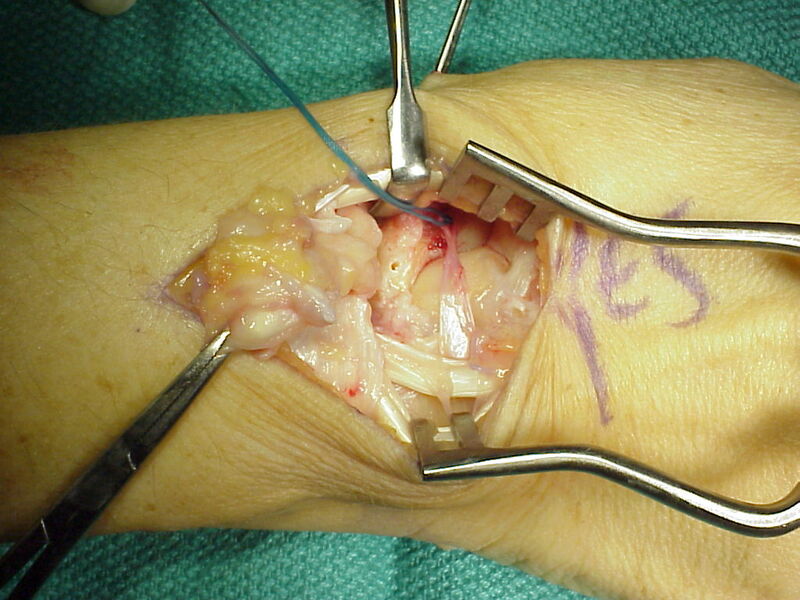 In theory, this recreates a physiologic force vector preventing excessive palmar flexion of the scaphoid. 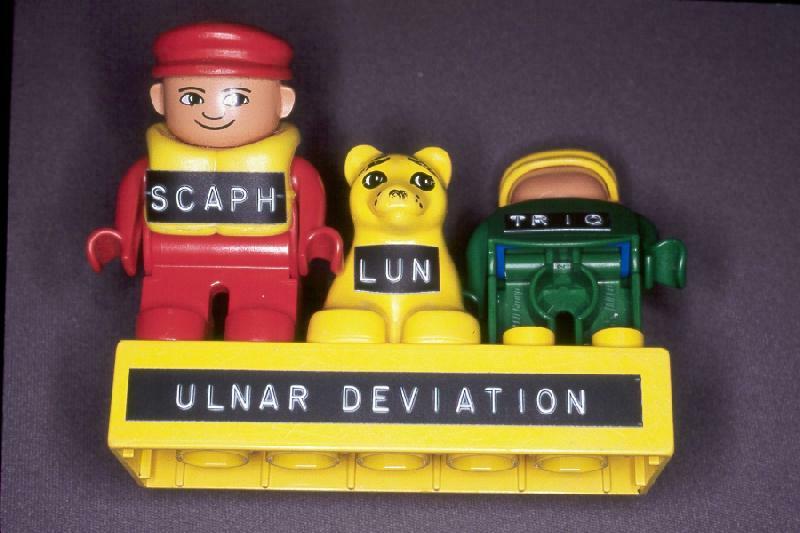 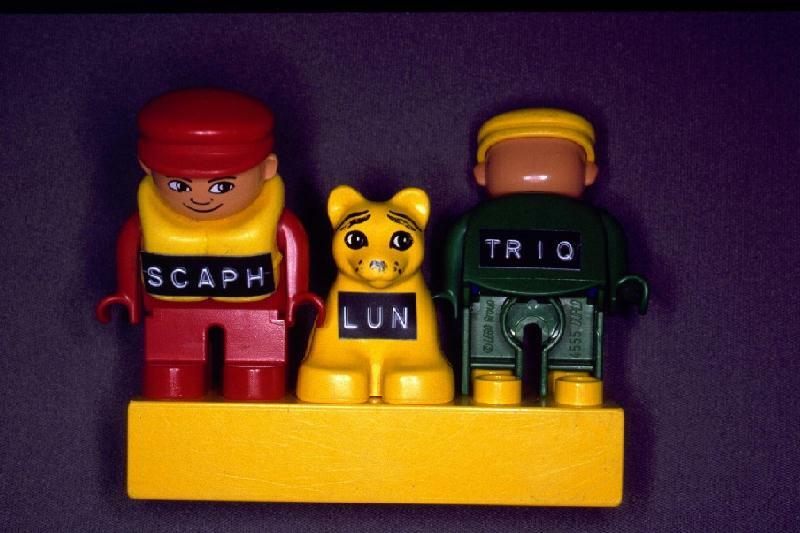 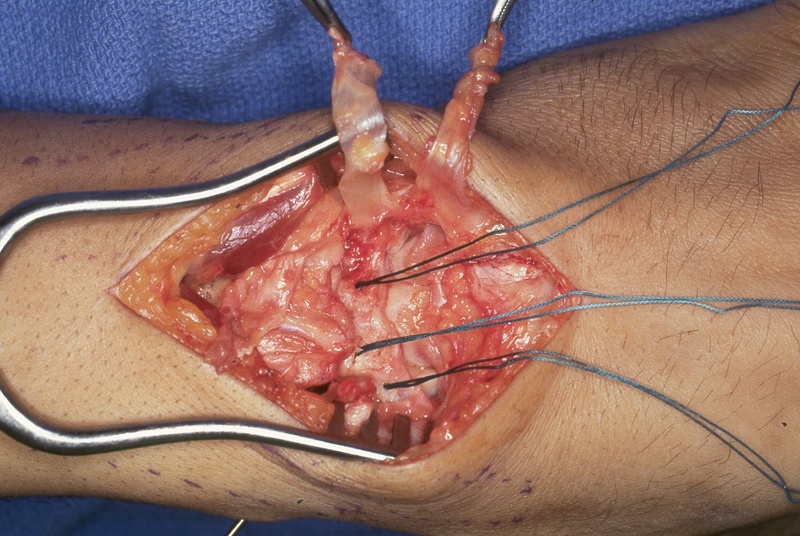 In a small series, results are comparable to other soft tissue - that is, patients had pain relief, but some loss of motion, and gradual recurrence of the scapholunate gap during the first postoperative year. 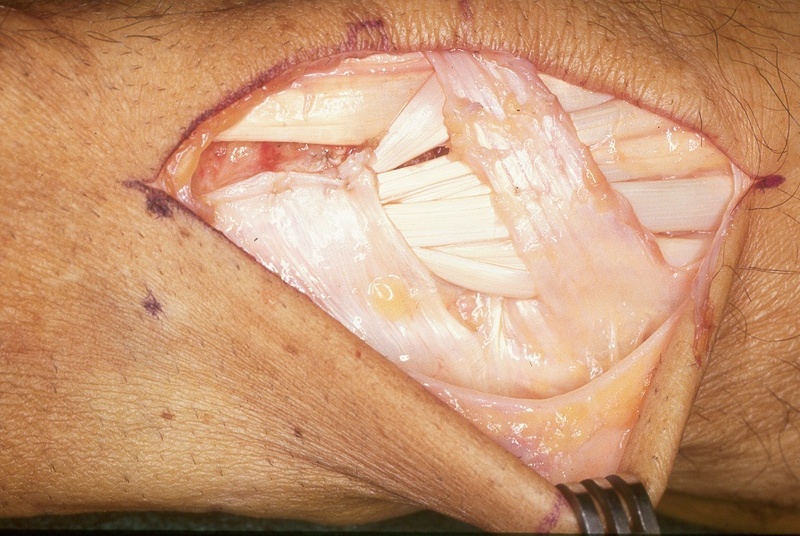 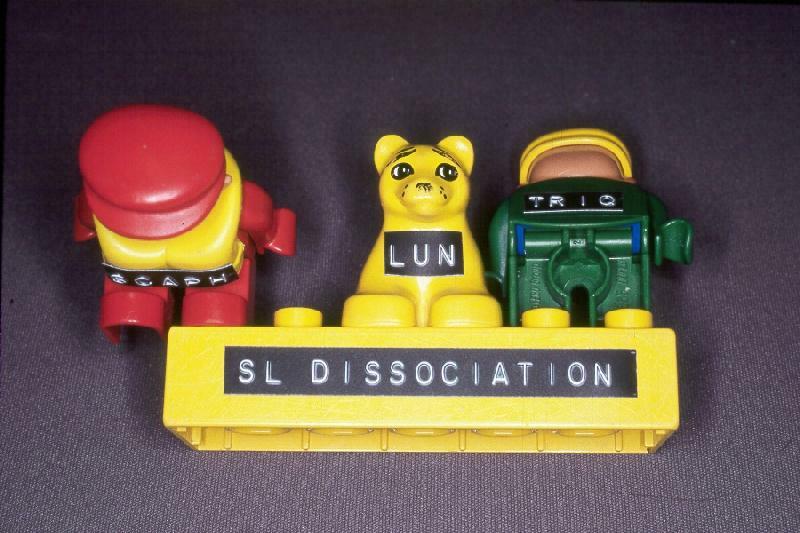 These cases are presented simply to show some details of the technique. 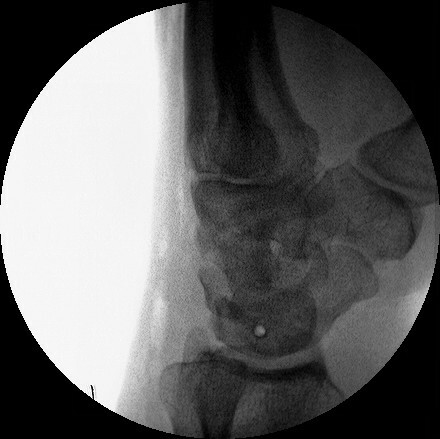 The indications and outcome for this approach remain to be established. 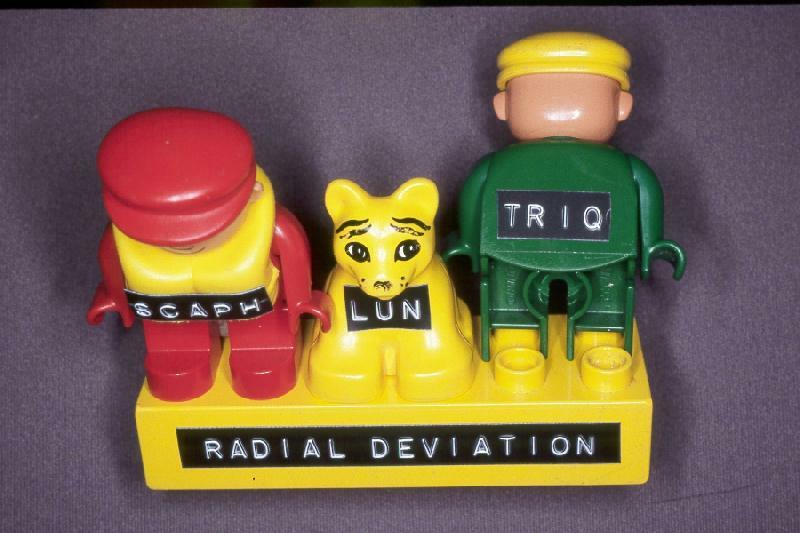 Radial deviation: The scaphoid palmar flexes to accomodate the descent of the radial wrist. 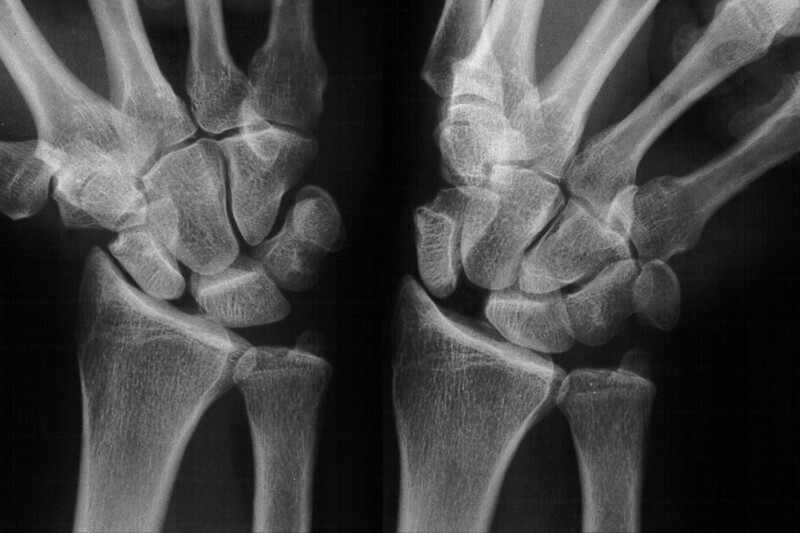 Ulnar deviation: The proximal row dorsiflexes, bringing the scaphoid up and the triquetrum down to accomodate the proximal movement of the ulnar wrist in ulnar deviation. 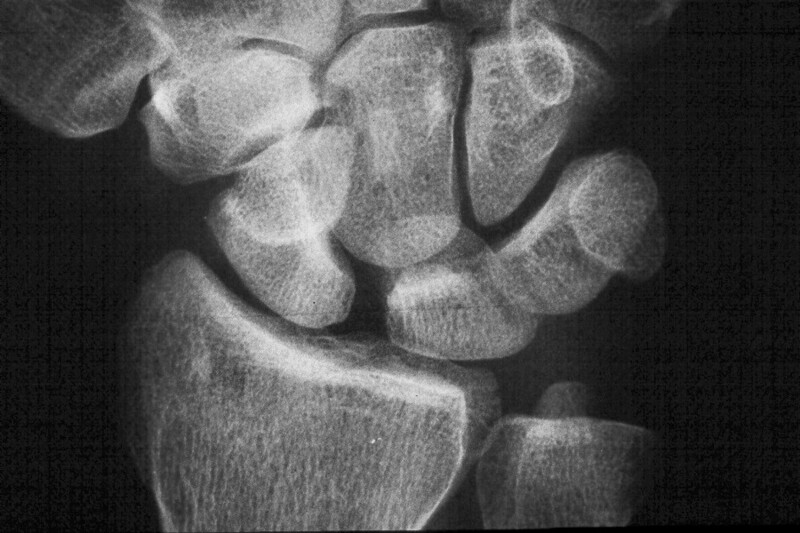 Scapholunate dissociation: The scaphoid palmar flexes and translates away from the lunate-triquetrum complex, which dorsiflexes. 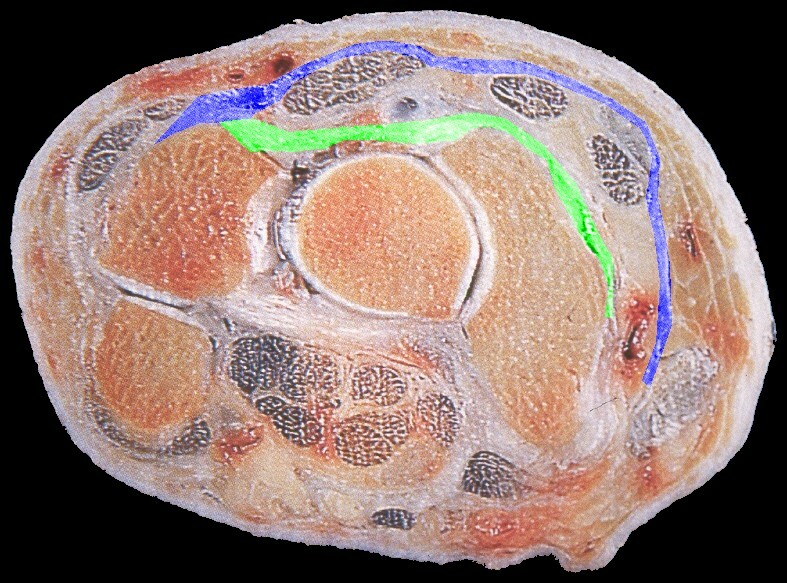 Palmar flexion of the scaphoid, lunate dorsiflexion. 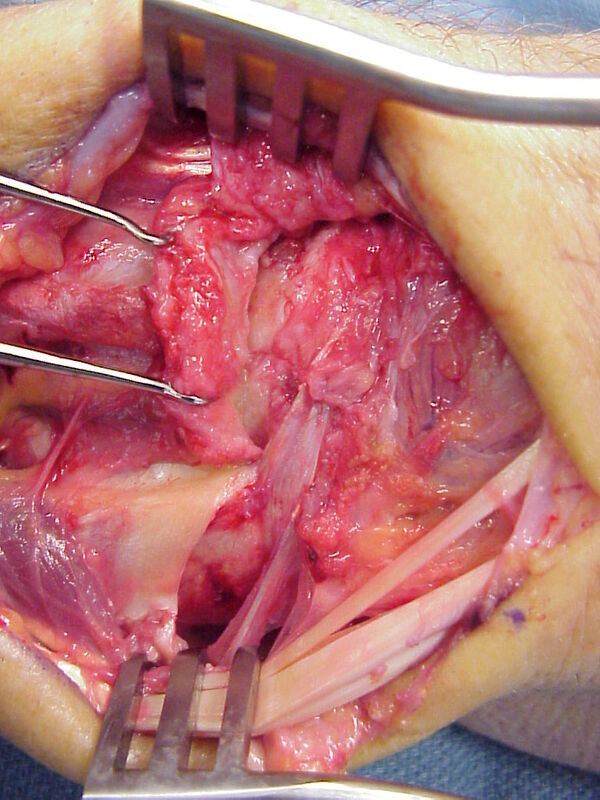 Intraoperative correction of scapholunate rotation using K-wires as joysticks on each bone. 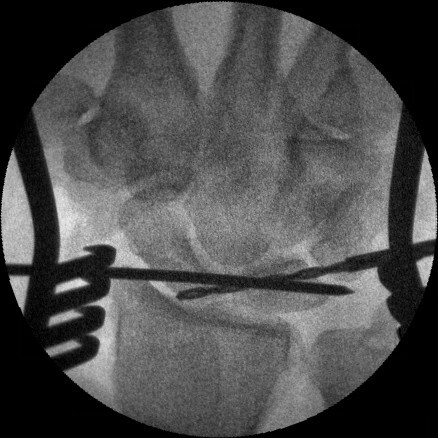 The retinaculum graft crosses over the capitate and is secured to a trough created in the dorsal distal scaphoid using a bone anchor. 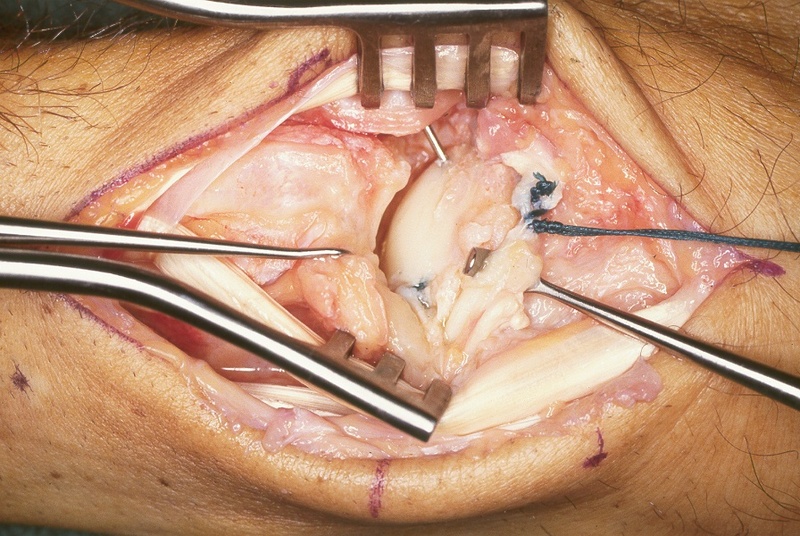 In this case, a dorsal capsulodesis was also secured to the same anchor attachment. 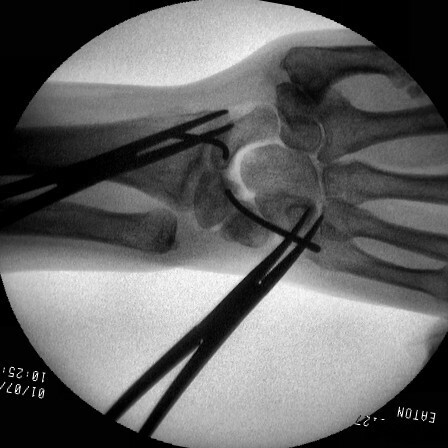 Additionally, the original ligament remnant was unfurled from the lunate and reattached to the proximal scaphoid using a second bone anchor - a 3 point reconstruction. 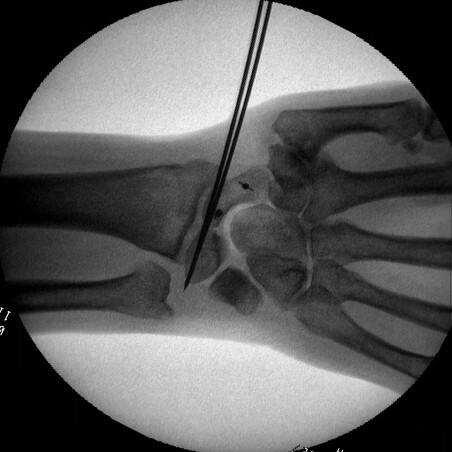 Scapholunate pins and bone anchors - intraoperative fluoroscopy. 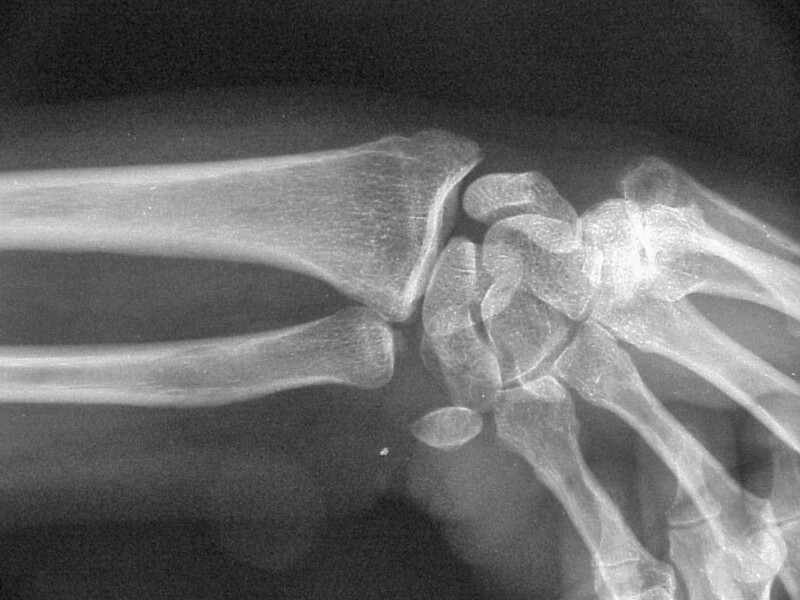 Closure of retinaculum showing the area of the donor strip. 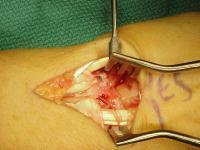 In this case, the scapholunate repair was stabilized with absorbable (Bionx) screws. Provisional fixation for two screws with a pin and a drill. These were then replaced with screws, which are radiolucent. Lucency where a screw lies. Unfortunately, the screws did not provide adequate stability and lost purchase about six weeks postoperatively. 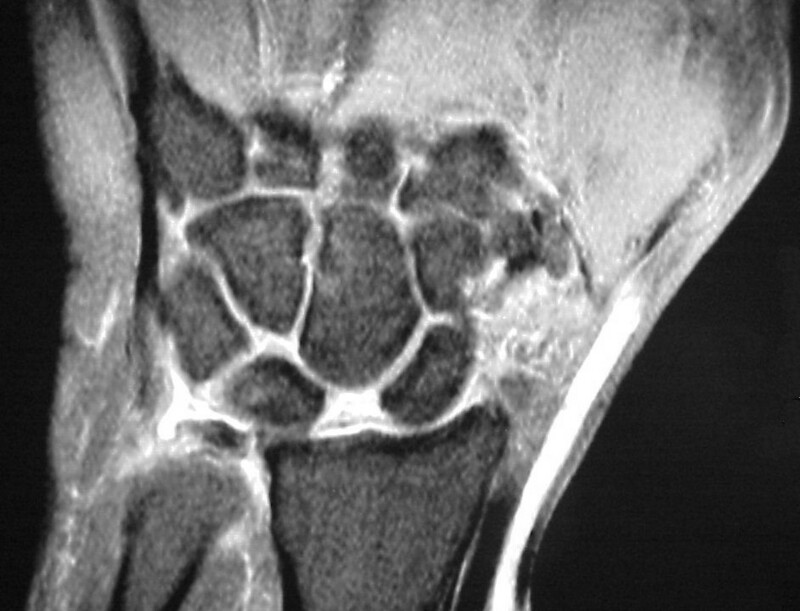 Symptoms remained improved despite early radiographic recurrence of scapholunate diastasis.